CORVALLIS, Ore. – Earthquake researchers are looking to the past to help protect us from a future disaster. It's been 317 years since the last major Cascadia Subduction Zone earthquake shook the earth. Researchers say it left earthly evidence in coastal bays and marshes. Combined with detailed written records in Japan, scientists were able to find out the exact time it happened, which was at 9 p.m.
From that information, scientists have discovered in the 10,000 years there have been about 46 earthquake events in total, of different sizes. Scientists at OSU say the last major earthquake can tell us a lot about future ones. OSU has the biggest tsunami research facility in the United States. "We're like, the biggest by an order of magnitude; nobody else has tanks like these that make tsunamis,” said Alicia Lyman-Holt with the Hinsdale Wave Research Laboratory. The man-made waves at the OSU facility are triggered by the push of a button, but real tsunamis are triggered by earthquakes. If we ever experience an earthquake similar to the one that happened over 300 years ago, we'll see much bigger waves. "There's no way to predict earthquakes in the future but if we look into the past we can see how frequent they were, how big they were, spatially, what extent of the Subduction Zone they covered, and then we can play the odds, calculate the probabilities from that,” said Dr. Chris Goldfinger with Oregon State University. 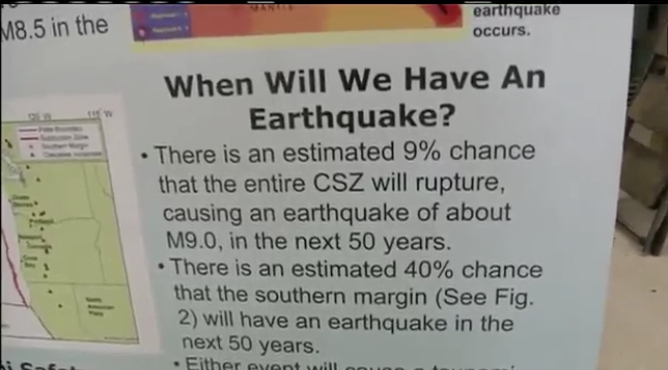 Scientists say there’s a 40 percent probability that a Cascadia Subduction Zone earthquake at a magnitude of 9.0 or higher will occur in the next 50 years. Oregon Representative Peter DeFazio has introduced a bill to help fund an earthquake early warning system. He argues it could save thousands of lives and billions of dollars in damage. But Goldfinger says that would only give us a few seconds of warning, which won't help. “If you have more than a few seconds, let's say half a minute to a minute, which is possible, it may do quite a bit of good as far as evacuating collapse-prone buildings and things like that,” said Dr. Goldfinger. In the meantime, researchers at OSU will continue to make groundbreaking waves around the country. "Some of the outcomes, the larger outcomes, of our work have been to actually be part of developing a new building code for tsunami resistant structures that the American Society for Civil Engineers just adopted,” said Lyman-Holt. Nobody can say what's coming in the future, but Goldfinger says if we plan based on the past, we can put ourselves in a good position.